It is a papulosquamous disorder patterned on the sebum-rich areas of the scalp, face, and trunk. 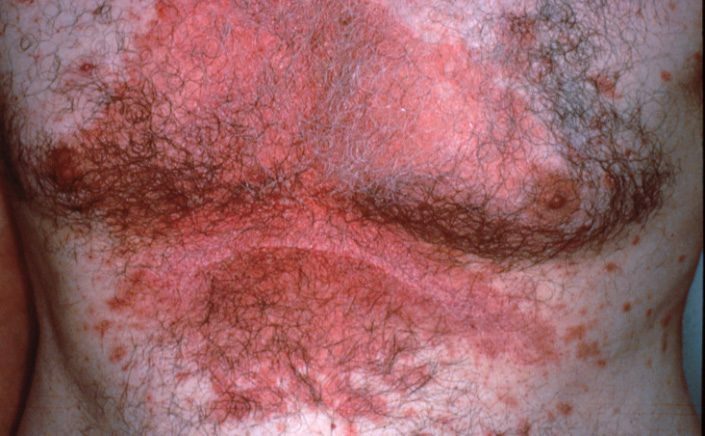 In addition to sebum, this dermatitis is linked to Malassezia, immunologic abnormalities, and activation of complement. Its severity ranges from mild dandruff to exfoliative erythroderma. Topical corticosteroids may hasten recurrences, may foster dependence because of a rebound effect, and are discouraged except for short-term use. Skin involvement responds to ketoconazole, naftifine, or ciclopirox creams and gels.